In a perfect world, black people wouldn’t face incessant discrimination over our choice of dress, dialect, impeccable seasoning prowess, or how we chose to do our hair. But because certain occupants of “The Land of the Free” and “Home of the Brave” won’t ever leave us the hell alone, innocuous clothing like hooded sweatshirts have somehow become a source of contention. 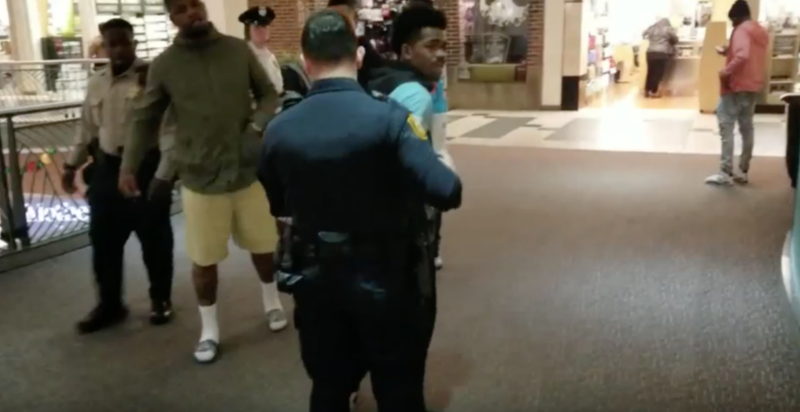 In the latest example of Racial Profiling Gone Wild, a former journalist has accused police of doing exactly that after an incident at Wolfchase Galleria, a mall in Memphis, Tenn., in which a black teenager was arrested for violating a mall’s dress code. His crime? Wearing a hoodie. Kevin documented the encounter in a post on his wife’s Facebook page. Soon after, the security guard then pulled out his radio to call in reinforcements, leading to the immediate arrival of a police officer who then escorted the teenagers out of the mall. When Kevin then attempted to intervene, he was informed that the teenagers had violated the mall’s dress code by wearing—you guessed it—hoodies. Which coincidentally, the Wolfchase Galleria’s “code of conduct” makes no mention of. After leaving, the teens then returned to the mall entrance, with one contesting that “we have rights.” At that point, about four law-enforcement officials confronted the teenagers before they could reenter the shopping center and threatened to arrest them for “criminally trespassing on private property”. It was at that point that one of the teens was then handcuffed. Thankfully, in order to preserve the teenager’s safety, Kevin decided to record the incident. But doing so made him an immediate target as well. “[A] black sheriff’s deputy approached me and told me I also was breaking the mall’s rules. ‘You’re in violation of mall policy,’ he said. ‘So you can be asked to leave too, so you might want to put your phone up,’” Kevin wrote. But because he kept filming, he was handcuffed and escorted to a back office as well. While handcuffed, Kevin argued against the discriminatory nature and enforcement of the dress code. “The officers could have issued me a misdemeanor citation and released me, but I was told that because I continued talking, I was going to jail,” he wrote. According to Kevin’s recount, a toe infection that required medical care saved him from being whisked away to jail. He later learned the teenager that was in custody was released and issued a citation as well.